Although designed primarily for those working with children who show developmental delay in language skills, these resources could be used with young EAL learners of the English language who are developing normally. Suitable for use in school, in the speech and language therapy setting, or at home (as back-up or in home schooling). The provision of the four Levels of questioning allows for small group work with groups containing children at different stages. Everyone can be challenged. Or you can use the resource 1-1 where the Levels provide current and future input. The titles are listed on TES at £4.00 each. That is the only place you can acquire the full resources. There are ten titles. The resource display on TES allows you to glimpse what is included in each before you buy. Please respect my copyright on these paid-for resources. They take many hours to make and are very reasonably priced. Constructive comments are welcomed either on TES or via the Contact form. Category cards with four examples of each category for vocabulary learning and sorting. Additional set that includes some early topics (Egyptians, Greeks, Romans, Vikings, Tudors, Victorians, WWII) and curriculum lessons. 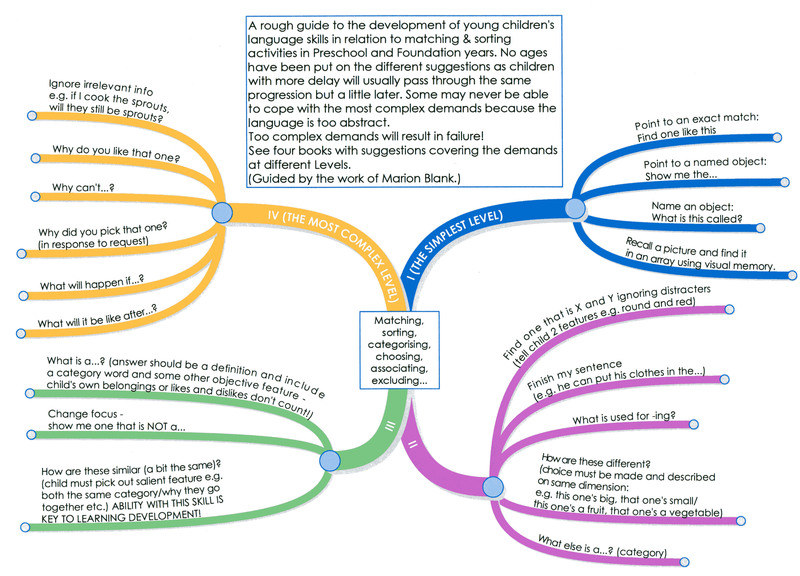 An ideas map (see below) outlines the development of language skills in children in Preschool and Foundation (age 3:0-5:11 approx.) and four books detail graded activities you can carry out with these cards or other card sets (e.g. topic pictures). Useful for children with or without language delay/disorder. Could also be used for EAL work. NB Not every item is on the map. You can find more details in the linked articles from this post. FURTHER EXAMPLES OF VOCABULARY PICTURES (GENERAL & TOPIC SPECIFIC) lang of learning 3 Suggestions included. Most tasks are at Levels I & II but there is always scope for extension work by building in recall / using more pictures at a time etc. Included are 24 pages of common vocabulary for matching by association, talking about why things go together / what things are for / making up descriptions, and 19 pages of topic vocabulary pairs. All presented with an idea per page for a task. Many can be used for other tasks as well. There are many other resources in my complete Index which can provide material for specific practice of the different Levels. Working with Marion Blank’s Language Levels is really just a way of thinking about any resources and it gets easier with practice. Many Topic resources have vocabulary pages: search the Index using Ctrl+F for Vocabulary entries. For extra Spot the Difference tasks, search for Activity Book entries. Search for verb if you are after action words in particular. FORCES: WHAT MAKES IT MOVE?